When playing a scenario, it is often convenient to set a number of turns within which one or both sides need to achieve their objectives. However, how many turns are appropriate for a given scenario? This clearly depends on the ruleset in use, but there are some rules of thumb I have used over the years, and a neat little mechanic to make the number of turns a variable factor in the game. In my gaming group, we have a running joke that says that a given scenario ends "at the end of the wargaming day". This is a phrase often used by Charles Grant in his famous scenario books, without any further explanation. We always are/were confused whether he meant the end of the wargaming day for the players, or the end of the simulated wargaming day for the armies on the table. Hence, we often refer to it jokingly whenever someone asks about the end of the scenario. It's always "the end of the wargaming day". How far do troops move per turn, versus the projected total movement distance? A typical example is an attack/defence scenario. Suppose the attacker starts at his own baseline, and needs to take a number of objectives (hills, towns, ...) roughly situated at the defender's baseline. Let us further assume that the table is 120cm in width, and that an average move is 15cm (6") per turn. This then translates to 8 turns needed to cross the width of the table. Thus, if you put the scenario length to shorter than 8 turns, the defender will have a hard time - or an impossible time - of reaching the objective. However, troops will not move at full speed in a straight line. You need to give some allowance for the attacker to manoeuvre across and around the battlefield. Hence, I often multiply the minimum number of turns needed by 1.5, resulting in 12 turns for the scenario above. Can troops move and fire, or only move during the turn? The above result of 12 turns assumes that units can move every single turn. But suppose your ruleset only allows movement or fire. Sure we want the attacker to fire at the defender as well, and any turn in which firing happens, movement will not happen for a firing unit. In the case of a static defender, the defender does not need to move and can fire every turn. In a typical attack-defence scenario using a move-or-fire ruleset, we might want to give the attacker at least the same firepower as the defender. The attacker therefore needs twice the amounts of units, half of which will/can fire during a turn, while the other half is moving. Thus, if we want to give every unit the opportunity to reach the objective, we need to double the number of turns, resulting in 24 turns. Do we have an activation mechanism? Some rulesets do not allow every unit to do something. A system using cards or command rolls might restrict the number of units that can be activated during the turn. Suppose any given unit will have a 50% probability of getting activated. That means we have to double the number of turns, in order for our unit to reach the objective. Doubling our 24 turns from above, we now have a 48-turn long scenario. The calculations above are only here to illustrate the process. If you use different assumptions, or put different restrictions on how many units need to reach the objective or move over a certain total distance, the multipliers will vary, and you will end up with a different total number of turns. Computing how many turns we need is one thing, but should that imply the number of turns is this fixed number? Most gamers are probably familiar with the last-turn-all-out-attack syndrome. If a player knows it's the last turn, he will risk anything to reach the objectives, because he knows there's no risk for the enemy to take advantage of it if all goes wrong, since there are no more turns left. Some boardgames therefore use a mechanic to determine the last turn in a random manner. Starting at some point during the game, a random number (die roll, card drawn, ...) determines whether this was the last turn or not. Many different variants exist. There is no reason why something similar cannot be used in a miniature wargame. Turn 22:: game ends with 100% probability. Whatever mechanic you use, be sure that the game does end! In my games, I often use a mechanic(*) that allows players to take a certain amount of control over the length of the game. Suppose the scenario is set to last for 20 turns. During the game, whenever a players rolls an exceptional result during some procedure (e.g. a double-6 on a 2D6 for a command roll, or a random event, ... ), he has the opportunity to increase or decrease the number of turns by 1. Thus, if a player feels he still needs time to reach his objectives, he will often add 1 to the number of remaining turns. If he feels he needs to speed things up, he might subtract a turn. Or he might choose to leave things as they are. We have used this mechanic in various games with different rulesets, and it often provides a healthy dose of suspense. In some games, it doesn't do much, but in other games, the count has gone up or down a few times. And towards the end of the game, the situation can become really tense and provide a lot of amusement and unexpected outcomes. If the event of altering the turn count happens infrequent enough, players do not have the impression it's an uncontrollable random device, but rather a little extra resource they can use to their benefit. I even have a special large D20 specifically for this gaming mechanic. The D20 indicates the remaining number of turns (thus, every turn, the die is reduced by 1), but when the special roll or special event occurs, the player can dramatically and with the right amount of pathos turn the die up or down by 1. 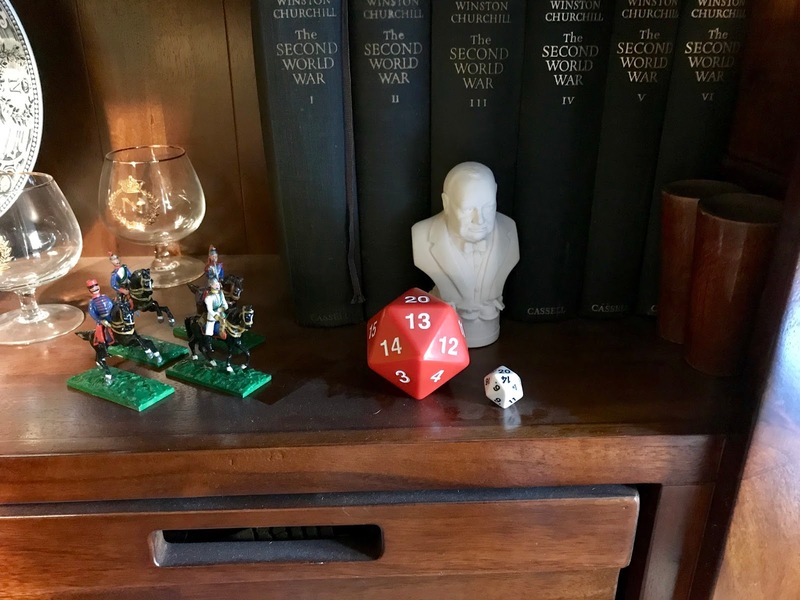 My oversized D20, next to a regular D20. Some 42mm toy soldiers for size comparison as well. Winston Churchill noddingly approves. (*) I encountered this particular mechanic in the first issue of Battlegames magazine (2006), where it was attributed to the ruleset Pieces of Eight. I like games which have a fixed number of turns *after* which you roll for game end (at the end of a turn, so no-one knows if what has been played was the last one). But I do lie that mechanism where a player can alter how many turns have passed; I will have to incorporate that into a game at some point. Yes, rolling for the game to end at the end of a turn seems the more sensible thing to do! The "last-turn-all-out-attack" syndrome; I know it all too well. Your ideas on variable game length are good ones. Norm at Battlefields and Warriors has an interesting variable game clock to put some variability into game length too.